The Destiny of an Emperor III for Sega MasterSystem (fan-made version) is, unfortunately, not available in English – but now, with this playguide, you can enjoy it anyway! Simply study this guide, open Taishi Ci 2.0’s walkthrough, play away. Thanks to CommieCatGirl for providing the initial translations that made it possible to learn this game, and to Thanks to Taishi Ci 2.0 for providing screenshots and information necessary for this guide to be assembled. I could not have made this without them. If you have any feedback or suggestions, please email me. Enjoy! Introductory game screenshots and corresponding explanation. Choose “START” to start a new game, “CONTINUE” to continue a saved game. 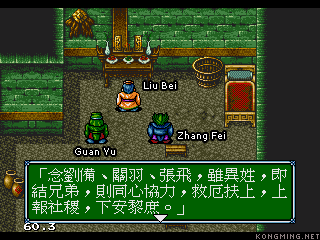 The game begins with Liu Bei (right) talking to his mother (in the bed). 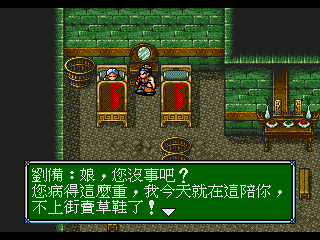 Because the game has not yet been translated to English, you obviously won’t understand what is being said in cut scenes such as this, but if you use Taishi Ci 2.0’s strategy guide, in combination with the information found here, you will still be able to play and enjoy this game. If you have a basic understanding of Chinese Hanzi, or at least character names and appearances, in addition to knowing the storyline of the novel, you might even know what is happening, too. 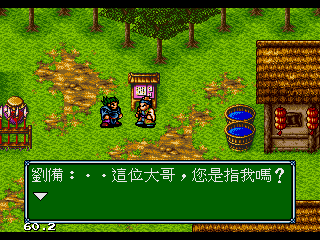 After reading the recruitment notice in Lou Sang Village, Liu Bei meets with Zhang Fei. You go on to meet Guan Yu, and together the three of you pledge to restore the Han. To seal this vow, and your sworn brotherhood, a sacrifice is made, and your cause is proclaimed to the heavens. In the novel, this took place in the Peach Tree Garden. 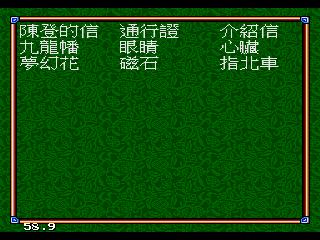 And now, some instructions on how to navigate the many menus of Destiny of an Emperor III. Fortunately, the game borrows a great deal from other old-school role-playing games such as Final Fantasy, so armed with that knowledge, you will find much of it to be quite intuitive. This is the main menu. 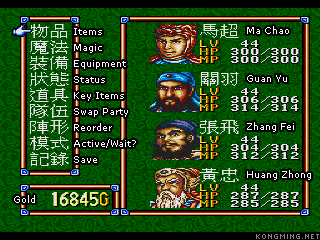 The options on the left-hand side, from the top down, are Items, Magic, Equipment, Status, Key Items (storyline-critical items), Swap Party (for moving party members in and out of your active team), Reorder (for changing party members’ order, and moving them between the front and back rows), Active/Wait (presently unknown), and Save (for loading and saving your game). Below this menu, you can see how much gold you currently have. In the right-hand window, you can view your active party. Each has a portrait, name, level, HP (hit point) total, and MP (magic point) total. Same screen as before, except the party members have been swapped out. Also, notice that Zhao Yun is in the front row, while all your other characters are in the back row. Characters in the front row deal extra damage but also take extra damage—an excellent position for warriors. Characters in the back row deal and take less damage. 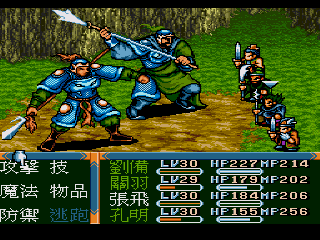 If they are casting magic or are armed with a ranged weapon, however, they will deal normal damage despite being in the back row (an ideal place for a character like Zhuge Liang). This is your item management screen. The three options at the top, from left to right, are Use (use an item), Sort (arrange items according to a pre-defined order), and Drop (throw away an item). When you Sort healing items are always placed at the top—very useful for understanding item purposes while first playing the game. 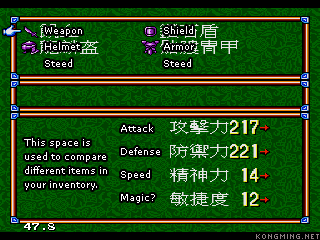 Special items, such as equipment, are all marked with small graphics so you can identify what they are for (such as weapons, shields, helmets, and armor). 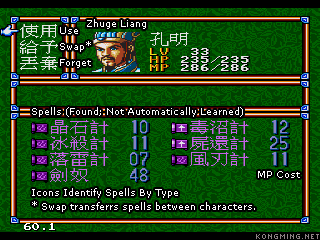 Here is the magic screen for Zhuge Liang. Unlike most other role-playing games, your characters will not automatically learn magic as they receive level-ups. Instead, you find magic in dungeons, inside red pots (which may also contain items). Once you obtain a spell, you can teach it to a character. Using the three menu options in the upper left-hand corner, you can Use (cast a spell, if available for out-of-combat use), Swap (transfer a spell to another character), or Forget (delete a spell—not recommended unless none of your characters have any further use for the spell). 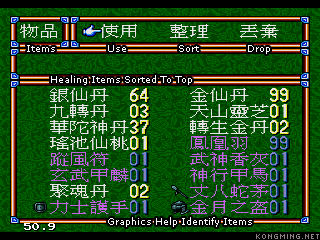 As with items, small graphics designate what type each spell is (healing/status or attack/summon). When you choose to manage a character’s equipment, you will be presented with this menu. 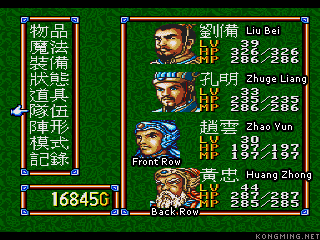 From right to left, top on down, each slot is reserved for weapons (each character uses a specific weapon type, as they did in Destiny of an Emperor II), shields, helmets, armor, and steeds (not pictured). In the bottom window, you can compare items. From the top down each value is Attack, Defense, Speed, and Magic. Arrows indicate whether an item will result in a gain or a loss, and in what areas. The bottom-left hand window is reserved for you “Limit Breaks” (for lack of a better word). As in Final Fantasy VII, a character builds up a limit break bar in combat. When full, that character may execute any of the attacks listed here. As you play, familiarize yourself with their effects. 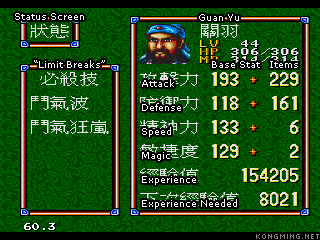 In the right-hand menu, your character’s stats are presented. At the top, you see the same information found in the main menu. Below, you find the following stats, from top down (Attack, Defense, Speed, Magic, Experience, and Experience Needed for the Next Level. Each of the four main stats are listed with two values (your base stat on the left, and item modifications on the right). As found in many other role-playing games, your storyline key items are shown here. In the left-hand window, you will find your current party. 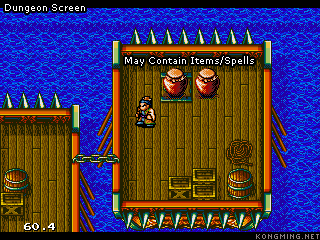 You can swap them out for alternate characters (pictured to the right) by selecting one, then selecting a replacement from the right-hand menu. This is the China World Map. Starting in Chapter II, you can access it by pressing Start while on the world map. Your current location is designated with a white square, and other locations with a yellow square. 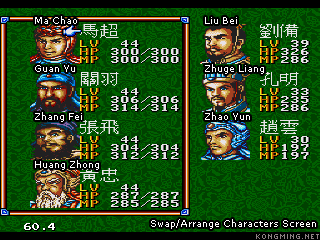 A selection box indicates which area you currently have selected (in this case, Xu Zhou). 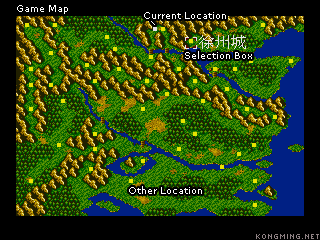 The game begins in this area, and gradually progresses clockwise around the map until you draw to an end back in the northern territories around Luo Yang. It looks busy, but in fact, it is a basic role-playing game shop menu. The upper-left-hand options, from left to right, are Buy and Sell. In the upper-right-hand window, you will find your current location, and your current amount of gold. 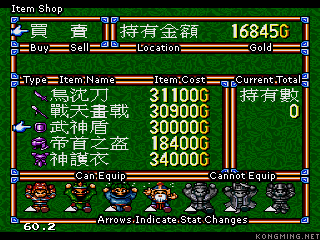 The left center window lists the shop’s inventory (again designated with item graphics) and each item’s cost. When you highlight an item, graphics of all your characters at the bottom indicate how that item would affect each character, and the center right-hand window tells you how many you already have. Grayed out characters cannot equip it. Up indicates an improvement, down a loss. And finally, some instructions to help you through dungeon maps and battles. Here’s your typical dungeon screen. You control your character on this screen with the direction pad. Inspect items with the action button. The two red pots pictured above are excellent sources for new items and spells. Watch out for them. As in Chrono Trigger and Secret of Mana, enemies can be viewed on-screen, and combat is initiated when you touch one of them. 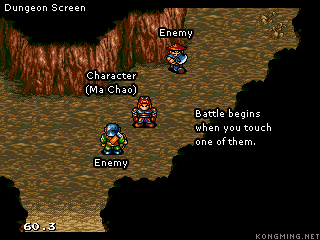 Unlike Secret of Mana, when you touch one, the game defaults to a separate battle mode (with features very much like those found in Final Fantasy VI). Enemies are pictured on the left-hand side, your party on the right. Stats in the bottom-right-hand window indicate the health and status of your party, and are lined in the same order your party is in the top window. 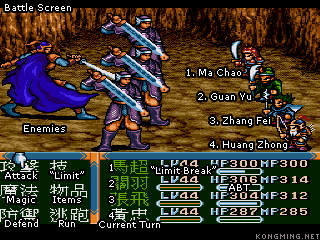 The options on the left-hand side, from left to right, top to bottom, are Attack, “Limit Break” (perform a special attack, read on), Magic, Items, Defend, and Run. Back in the bottom-right-hand window, a current character’s turn is indicated with white text. Two bars below each character’s status indicate, from left to right, the character’s “Limit Break” and their position in the Active Battle Timer (ABT). Both are concepts borrowed from Final Fantasy. As your character receives and deals damage, their limit break bar will build up. When it is full, the character can execute a special and very powerful attack, resetting the bar. In Destiny of an Emperor III your characters, and the enemies, take turns in accord with an Active Battle Timer. When a character executes a turn, it builds up for all characters. Whenever it fills for a specific character, that character may take a turn. The right-hand gauge indicates this value for you. 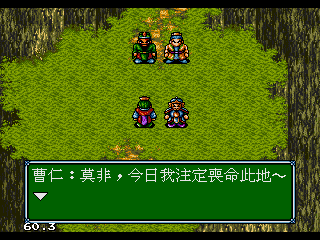 At the end of Bo Wang Slope, the Shu forces confront Cao Ren and Xiahou Dun in a cutscene. Boss fights take place at the end of levels. They are much more difficult than normal battles, and you should conserve your resources in order to fight them more efficiently. Still, the rules remain the same with one exception: you cannot run. If you cannot overcome a boss fight, and cannot thing of a better strategy to gain victory, save up some more levels and return. Destiny of an Emperor III (SNES) © Hiroshi Motomiya, Motokikaku, Shueisha. © Capcom Co. Ltd. 1995. 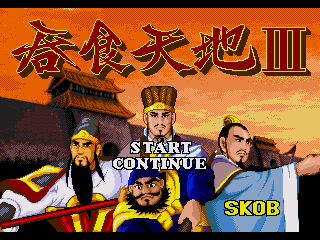 Destiny of an Emperor III (Sega MasterSystem) © SKOB.